Old Time Disney Delights - Not a Princess in Sight! Enjoy old-fashioned Disney films on a big screen as we present a series of Disney classics. Snacks permitted; shown with subtitles, when available. The days of canine superstar Bolt (John Travolta) are filled with danger and intrigue ... until the cameras stop rolling. But Bolt doesn't know that he's on a TV show; he thinks his amazing powers are real. 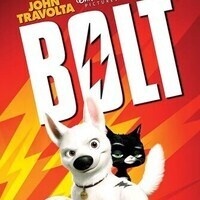 When Bolt is accidentally shipped from his Hollywood soundstage to the mean streets of New York, he begins his most-amazing adventure: Armed only with his delusions and accompanied by a cat and a hamster, he sets out to to find his owner, Penny (Miley Cyrus). Directors: Byron Howard, Chris Williams, 2008, 96 min.